Image courtesy of Can you spot the difference? If, like me, you are a collector of the various international editions of the IKEA catalog, you may have noticed something different about the version for customers in Saudi Arabia. No, it’s not a huge price difference on Ektorp couches. It’s a surprising lack of women in the photos. 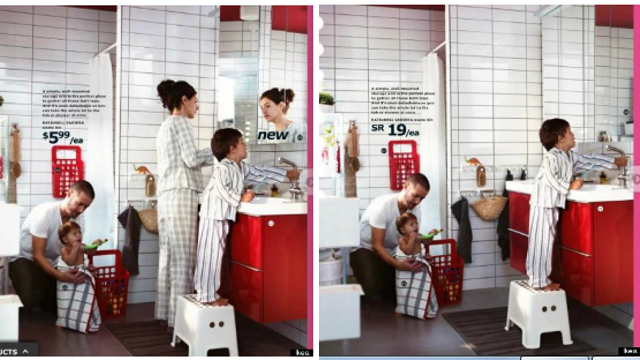 Apparently playing “spot the difference” with their own IKEA catalogs, the folks at the Swedish edition of Metro also noticed that adults with breasts had been mysteriously removed from photos in the Saudi version, calling into question IKEA’s commitment to gender equality. where is the couples therapy section?